Woman rescued from abandoned railcar after several days. On 3-10-19, at 1:27 PM, a female adult called 9-1-1 to report that she was locked in a railcar on the west side of Pomona for the last few days. Police Officers began their search and eventually found her 30 min later in a locked railcar near Valley Blvd and the 57 Frwy. The victim is homeless and was living in the railcar for the last week with an adult male aquaintence. On Wednesday afternoon, she gave the suspect money to go out to purchase food and drugs. The suspect then intentionally locked the door on his way out of the railcar; trapping the victim inside. The victim's cell phone did not function properly where she remained without food or water for 4 days. The victim was eventually able to make a 9-1-1 call today. 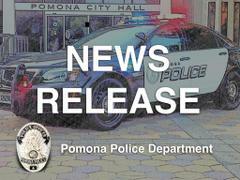 The female was transported in fair condition to Pomona Valley Hospital as a precaution to have her exmained by a doctor. The Pomona Police Department will be investigating this criminal act as a Felony, False Imprisonment. Detectives will attempt to identify the suspect throught information recieved in this investigation. Officers saw other homeless people in the area and removed 1 other person out of a railcar who was currently set up to live there. If you have information to report that could help lead to an arrest in this crime/crime activity, please contact police.